They announced yesterday the development of new technologies for the next-generation ASIMO humanoid robot, targeting a new level of mobility that will better enable ASIMO to function and interact with people by quickly processing information and acting more nimbly in real-world environments. The combination of newly developed high-response hardware and the new Posture Control technology enables ASIMO to proactively bend or twist its torso to maintain its balance and prevent the problems of foot slippage and spinning in the air, which accompany movement at higher speeds. ASIMO is now capable of running at a speed of 3km/hour. In addition, walking speed has been increased from the previous 1.6 km/hour to 2.5 km/hour. The next-generation ASIMO can maneuver toward its destination without stopping by comparing any deviation between the input map information and the information obtained about the surrounding area from its floor surface sensor. Moreover, ASIMO can now autonomously change its path when its floor surface sensor and visual sensors located in its head detect obstacles. 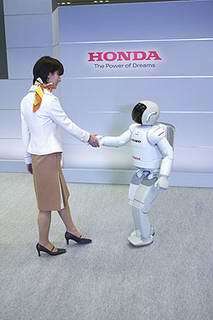 By detecting people’s movements through visual sensors in its head and force (kinesthetic) sensors which have been newly added to its wrists, ASIMO can now move in sync with people allowing it to give or receive an object, shake hands in concert with a person’s movement and step forward or backward in response to the direction its hand is pulled or pushed. Increased walking speed was achieved by the proactive rotation of the hips in addition to swinging of the arms, which cancel the reaction force generated when the legs swing forward during running or walking. Due to two additional axes in each wrist, the movement of the wrist area is more flexible.–Thumb joint: Previously, one motor operated all five fingers. With addition of a motor that operates the thumb independently, ASIMO can now hold objects of various shapes. With an additional axis added to its neck joint, ASIMO’s expressiveness has been enhanced. In order to realize “running,” two major obstacles had to be overcome. One was an accurate leap and the absorption of the landing impact, and the second was prevention of the slipping and spinning which accompany movement at higher speeds. In order to run, a robot has to be able to repeat the movements of pushing off the ground, swinging its legs forward, landing within a very short time cycle and without any delay, absorbing the instantaneous impact shock of landing. With a newly developed high-speed processing circuit, highly-responsive and high-power motor drive unit, in addition to light-weight and highly rigid leg structure, Honda realized highly accurate and responsive hardware with performance levels more than four times faster compared to that of the previous model. Due to reduced pressure between the bottom of the feet and floor, spinning and slipping are more likely to happen right before the foot leaves the floor and right after the foot lands on the floor. Overcoming the problem of spinning and slipping was the biggest control element challenge related to increasing running speed. Combining Honda’s independently developed theory of bipedal walking control with proactive bending and twisting of the torso, Honda developed a new control theory which enables stable running, while preventing slipping. Through these technologies, ASIMO is now capable of smooth human-like running at a speed of 3km/hour. Moreover, walking speed was increased from the previous 1.6 km/hour to 2.5 km/hour. When a human runs, the step cycle is 0.2 to 0.4 seconds depending on one’s speed, and the airborne time, when both feet are off the ground, varies between 0.05 to 0.1 seconds. The step cycle of ASIMO is 0.36 seconds with an airborne time of 0.05 seconds, which are equivalent to that of a person jogging. This entry was posted in Investment, Tech, The Future and tagged robotics, software. Bookmark the permalink.